More and more languages are now accessible through Internet and the need of a translation tool becomes obligatory. 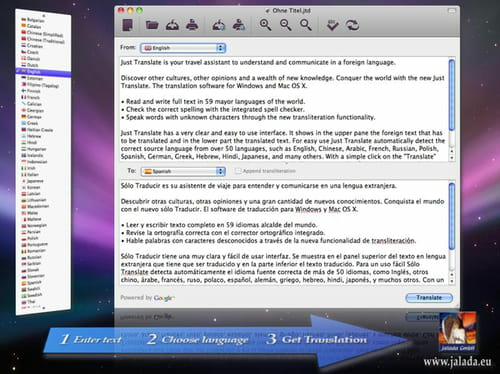 Just Translate is an ideal editor to translate and understand foreign language. Instant translation: Just Translate can translate more than 50 languages and can process while users are working in other applications. Translation can be done instantly and the result is of a good quality since it is using one of the mayor web-based translation services. Offline translation: thanks to its built-in proxy support, Just Translate users can have a direct access to translation even if they are offline. For that, the application is using a firewall. Check spelling: misspellings are automatically corrected by Just Translate. It may occur when the user types phrases in the translation box. Whatever is the language, the application corrects easily the writing of one or more words. Save and print: apart from that, saving the translation in a specific folder in the system is also an option. Printing them is also possible or exporting them as a PDF file if you want. Useful for translating web documents, manuals, emails and more. Latest update on May 30, 2016 at 05:16 AM.